March 2nd is Dr. Seuss’s birthday, he would be 112 this year. While he is no longer with us, his legacy lives on in the pages of his books. 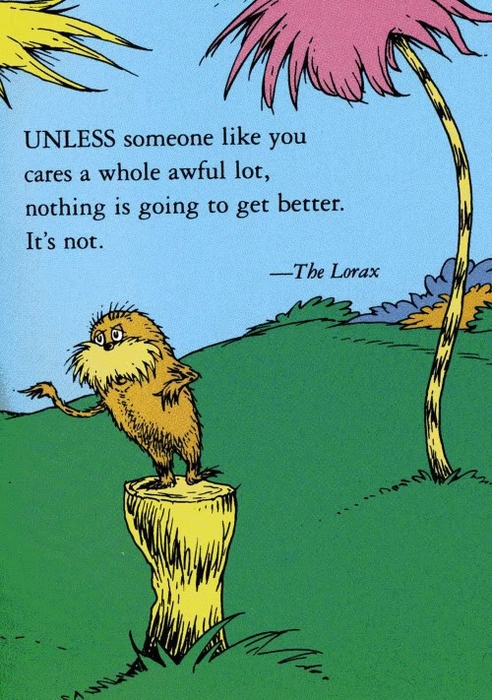 A book that all parents might want to read to their children is Dr. Seuss’s “The Lorax”. It’s message is most applicable to finally being recognized environmental crisis of global warming and climate change, which continues to worsen. Children should know we humans have already saturated Earth’s atmosphere with the residuals from excessive burning of earth’s fuels, the effect of which, together with the cutting down of the carbon dioxide sequestering tropical rain forest, has lead to an unhealthy and unnatural buildup of carbon dioxide and other greenhouse gases in Earth’s atmosphere, which means that more of the Sun’s radiant heat is being trapped near Earth’s surface, which has already caused destabilized the earth’s climate systems, to the suffering and harm to many living species, including millions and ultimately billions of the human population, in areas which have experienced major and significant changes in weather events, more severe storms and flooding in some areas, but not enough rain for others. A boy living in a polluted town visits a strange isolated man called the Once-ler “at the far end of town where the Grickle-grass grows… [on] the Street of the Lifted Lorax”, who never appears fully in illustrations; only his arms are shown. The boy pays the Once-ler fifteen cents, a nail, and the shell of a great-great-great grandfather snail to explain why the area is in such a run-down state. The Once-ler explains to the boy (shown in flashback) how he once arrived in a beautiful, pristine valley containing happy, playful fauna (Brown Bar-ba-loots, Swomee Swans, and Humming Fish) that spent their days romping around blissfully among “Truffula trees”. The Once-ler proceeded to cut down the Truffula trees to gather raw material to knit “Thneeds,” a ridiculously versatile invention of his, “which everyone needs”. Thneeds could be used as a shirt, a sock, a glove, a hat, a carpet, a pillow, a sheet, a curtain, a seat cover, and countless other things. By cutting down the tree, he summoned the titular Lorax to appear from the stump of a Truffula tree. He “speaks for the trees, for the trees have no tongues” and warned the Once-ler of the consequences of cutting down the truffula trees, but the Once-ler ignored him, instead contacting all his relatives to help him with his business. The Once-ler’s small shop soon grew into a factory and new equipment was made to keep up with the demand for more Thneeds, and signs of damage to the Truffula Forest became evident to the Lorax. The Lorax first complained to the Once-ler that the Truffula trees, being chopped down, were also the food source of the Bar-ba-Loots, who are now facing a terrible food shortage and a disease called “the Crummies because of gas and no food in their tummies.” To save them, the Lorax sent them off to find another food source. At first, the Once-ler only showed a little remorse, but still focused on expanding his business. Soon, the Once-ler’s Thneed-making business expanded tenfold and now used delivery trucks to take out the shipments. The Lorax eventually came back complaining to the Once-ler that the factories were belching out so much “smogulous smoke” that it was giving the Swomee Swans sore throats, leaving them unable to sing. After the Lorax sent them off, he also complained to the Once-ler about his machinery making a goo by-product called “Gluppity Glup” and “Shloppity Shlop,” and how it was being dumped into the ponds where the Humming Fish live, leaving them unable to hum and forcing the Lorax to send them away too. The Once-ler, disgruntled by this, still dismissed the Lorax’s pleadings and declared his intention to keep “biggering” his operations, but at that very moment, the “The very last Truffula tree of them all” falls. Without raw materials, his factory shut down; without the factory, his relatives left. Then the Lorax, silently, with one “very sad, sad backward glance”, lifted himself by the seat of his pants and flew away through the clouds.